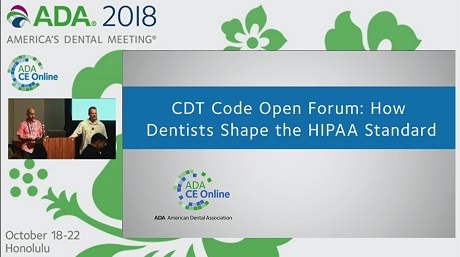 The Current Dental Terminology (CDT) Code evolves annually to meet needs of dentists and the dental community. This course will review significant CDT changes for 2019 to illustrate the process. Participants in this course are encouraged to ask questions and express their thoughts on current and upcoming CDT Code versions as well as their new procedure concepts. American Dental Association members from the Council on Dental Benefit Programs are the moderators and will answer questions.